Have you visited the surprising little gallery, tucked away in Woods Hall? The Sella-Granata Art Gallery features student exhibitions and special exhibitions, including visiting artists. It is also a favorite space for concerts, readings and receptions for campus organizations. Click here to find out what’s showing right now. Founded in 1998 as the Woods Hall Gallery, in 2009 the gallery was officially named for two longtime professors, Alvin Sella (painting) and Angelo Granata (sculpture). 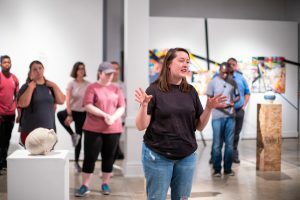 Foundations and introductory students, bachelor of fine arts senior exhibitions, master of arts exhibitions, thesis exhibitions for master of fine arts candidates, and a variety of solo, small and larger group exhibitions run throughout the regular school year, from August through May. The gallery is also the site of scholarship reviews, graduate reviews and other departmental events. Funding support for the Sella-Granata Art Gallery comes from the Department of Art and Art History and the College of Arts and Sciences. Admission to the gallery is always free. Hours are Monday through Wednesday 9:00 a.m.- 5:00 p.m., Thursday 9 a.m.-8 p.m., Friday 10 a.m.-2 p.m. The gallery is located at 109 Woods Hall in the heart of the UA campus on Woods Quad. Information about visitor parking is available here: http://bamaparking.ua.edu/visitor-information/. 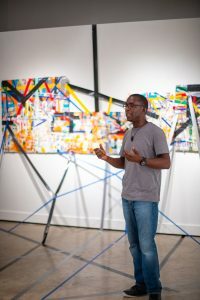 For more information, contact the gallery at (205) 348-2783 or go to https://art.ua.edu/gallery/sgg/.